What Does a Mailroom Clerk Do? Mailroom clerks are responsible for handling mail that is coming into and leaving businesses. Some mailroom clerk positions may be small operations at smaller firms, but large firms and campuses may have larger, more complex mailrooms. Interoffice communications also typically go through mailrooms. A job as a mailroom clerk often offers a means of getting a foot in the door in a particular industry or at a specific firm. Even though anyone with a high school diploma typically can handle the job, it does require organizational skills and attention to detail that can be valuable in almost any career. Mailroom clerks accept incoming mail and then process, sort, and deliver it to the proper recipients. They might also be tasked with sorting interoffice mail and messages and maintaining mailroom supply inventories. They'll probably have to organize and maintain the mailroom as it becomes their domain. Mailroom clerks also might be in charge of outgoing mail by preparing it for shipment, as well as logging and distributing overnight packages. Mailroom clerks also operate mailroom equipment, including postage meters, mail sorting machines, scanners, mail sealers, envelope openers, fold-and-insert machines, and labeling machines. Mailroom clerks fall under a broader category of information clerks in U.S. Bureau of Labor Statistics studies. Included in that broader category are positions such as receptionists, couriers, and information technology assistants. Mailroom clerks are entry-level jobs, so requirements are minimal. However, college students looking to get into a particular field might consider this type of job in order to begin making connections. For example, an undergraduate student studying prelaw might want to get a job as a mailroom clerk in a law firm in order to start developing a network and getting a foot in the door of the legal industry. Education: Most mailroom clerk positions require no more than a high school diploma or GED. Training: Most of the training is done on the job. Mailroom clerks typically start out working with an experienced clerk as they learn the duties of the job. Sort mail: As mail comes in, clerks need to sort through envelopes and packages for the most efficient means of delivery. Deliver mail: This sometimes includes the ability to lift heavy items. Meet deadlines: Mailroom clerks need to be able to work quickly and efficiently. Mail often needs to be delivered multiple times per day, and many documents or packages are time-sensitive. Job growth for information clerks is projected to be only 3 percent for the decade ending in 2026, according to the U.S. Bureau of Labor Statistics. This is less than half the 7 percent growth projected for all jobs combined. As technology increases and more communications and documents are delivered electronically, the need for clerks lessens. Mailroom clerks pick up and distribute mail throughout the firms where they work several times a day. Clerks get to meet and interact with staff at all levels and are exposed to many different aspects of a firm’s operations. Work schedules typically are standard business hours. 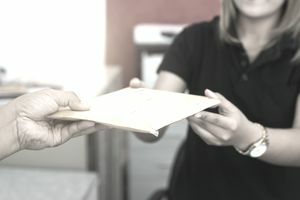 In some environments, mailroom clerks may need to start slightly earlier than others at a firm in order to make sure documents are delivered first thing in the morning when necessary. In many cases, mailroom clerk positions are entry-level jobs. If looking to get a foot in the door at a specific firm, earning a recommendation from someone already at the firm might be the best option.